What can we say in a Harbor Freight One Stop Garden's review that hasn't already been said. 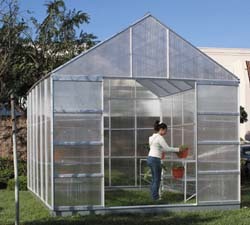 Often you hear "you get what you pay for" but even though the One Stop Garden greenhouse is one of the least expensive on the market, it isn't worth what you end up paying for it. If you do an imagine search for these greenhouses you'll find image after image of them destroyed from natural sources. If you're looking for a similar size, similar look, but 10 times stronger greenhouse for almost the same price we'd recommend you purchase our top pick, the Brighton Greenhouse. But if we can't talk you out of this Harbor Freight greenhouse, then we TRULY advise you to purchuse a strengthening kit.